CONCEPT: Louis XVI emphasized the straightness of forms, and the reformation back to the classical styling of the Romans and Greeks. Motifs such as egg and dart, cable fluting, festoons, and wreaths were used extensively. Native woods such as mahogany, fruitwoods, and cherry were the most frequently used wood types, with geometric marquetry as a popular veneer pattern. Furniture was at a smaller scale, and consisted of taped fluted legs. 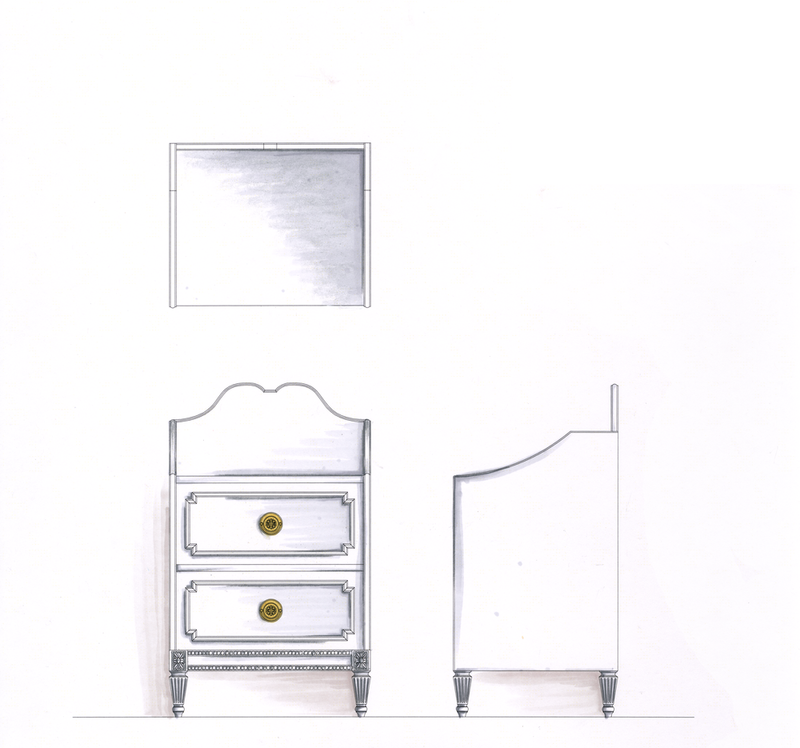 For this bedroom collection – I wanted to focus on keeping the stylistic integrity of the period, while also accommodating the lifestyle of today’s users. To create interest to the tops of my dresser and chest of drawers, I chose to apply sunburst and quartered veneer patterns. 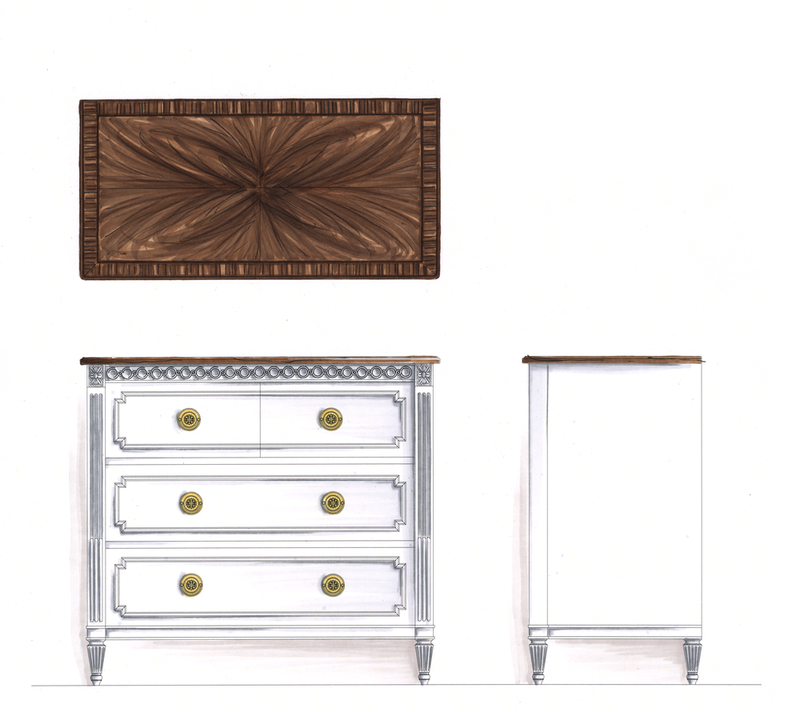 Since the chest of drawers is painted a matte white – like a blank canvas – I wanted to utilize the quartered walnut border and sunburst veneer patterns and apply it onto the top as a contrasting detail. Users of the bedroom influenced many of my design choices. I decided to design an accent demi-lune bench that can be placed at the foot of a bed or repurposed for another part of the home. 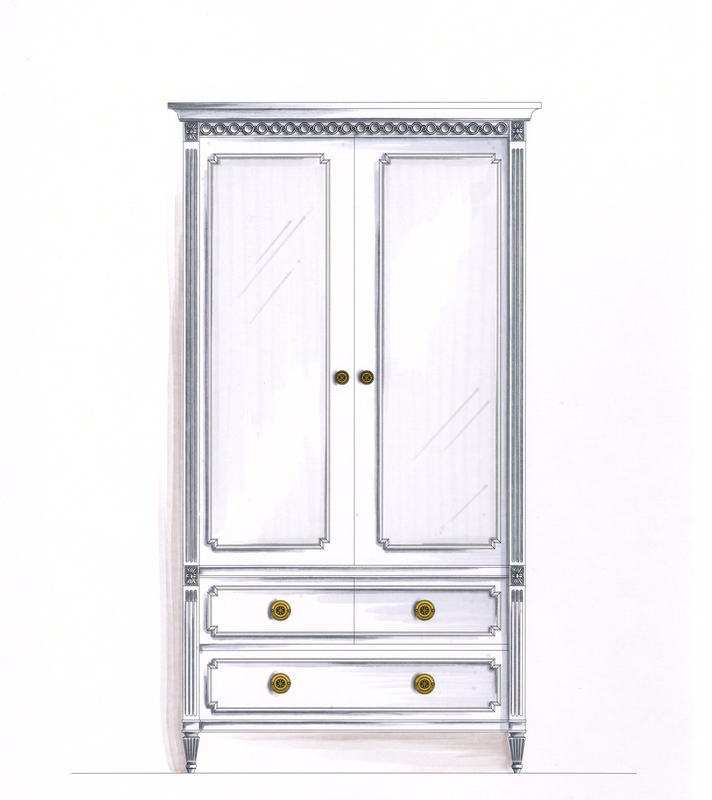 The dresser acts as storage and as a display area, and the mirror adds elegance and provides décor for the room. Designed to be a promotional collection, I kept the molding, leg type and materials consistent, and the pieces were painted a matte white, and green to exaggerate the details of the ornamentation, and to look less like court furniture.